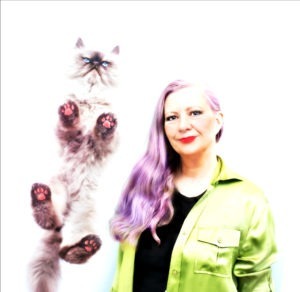 Today we explore a rosy-hued history of cats through the eyes of artists influenced by Egyptomania. The mania for art and culture from ancient Egypt stemmed from Napoleon’s Egyptian campaign and ebbed and flowed for over 100 years. 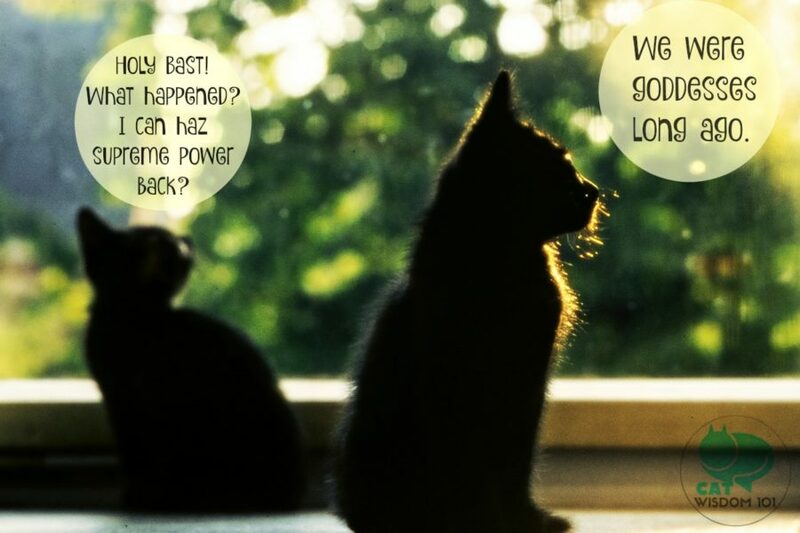 We all know cats were revered in ancient Egypt but it’s a very different story today. Descendants of the sacred cats roam the streets of Cairo, semi-feral and at the mercy of a different fate. Spay/neuter is not routine. Cat food and vet care are in short supply. Animal poisoning is common. The breed at greatest risk is the Egyptian Mau, but I’d like to think of Egyptian cats as our cat’s ancestors. Mau is the Egyptian word for cat. Whether technically Egypt, Israel, Syria, Turkey or the UAE, all cats are descended from Felis silvestris lybica, a wildcat species from the Middle East. The species no longer exists but all domestic cats are related to one of five variants of mitochondrial DNA passed on from five original female descendants. 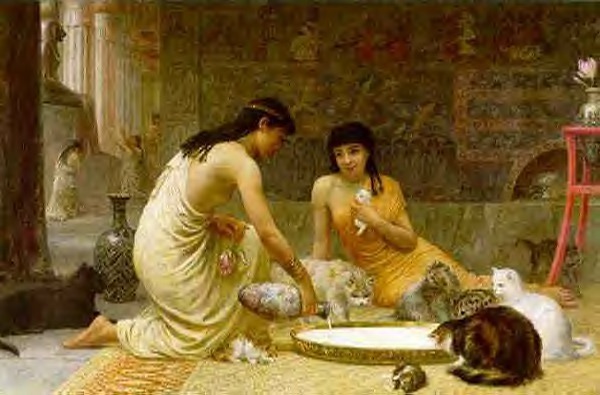 A romantic view of cats drinking milk in ancient Egypt by Edwin Long, a pre-Raphaelite artist in Victorian England. If you’ve ever wanted to visit the pyramids or love Egyptian art and history as I do, I urge you to visit EMRO, a Mau rescue site in Cairo launched by a Canadian woman in 2003. The group closed its doors last year but the info on the website is valuable for any cat lover. Most of the links to other rescue sites were either broken or not updated in years. Browsing felt like excavating ancient internet history. One of the few current links is for Spare a rescue organization, one of the few still functioning. 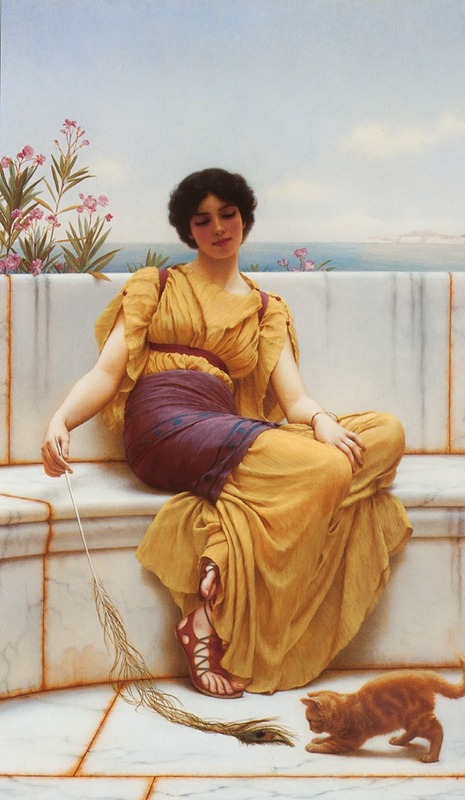 John William Godward an English Neoclassic artist renowned for his prolific work depicting ancient Egypt, Greece and Rome. Peacock feathers: a favorite cat toy for 3000 years or as long as there have been cats and peacocks. The feathers are a perennial favorite in our home. Animal welfare in the U.S. is far from perfect but most rescue groups have modern websites and use social media. Many of the large rescue organizations spend millions annually on marketing efforts for a disproportionately small adoption rate. CharityNavigator.org does a good job sorting the metrics but to dig through a big charity’s 990 filing and its itemized expenses are eye-opening. The good news is charitable contributions for animal welfare are up 8% globally this year. This post aims to paint a romantic image of cats and Egypt but perhaps by doing so, awareness tourism can shed light on the plight of cats we all hold dear. I’d like to see every cat lover tourist to Egypt bring a few cans of cat food, cat care items or make a donation to a local veterinary clinic where zero funds are spent on marketing campaigns. Suggestions anyone? 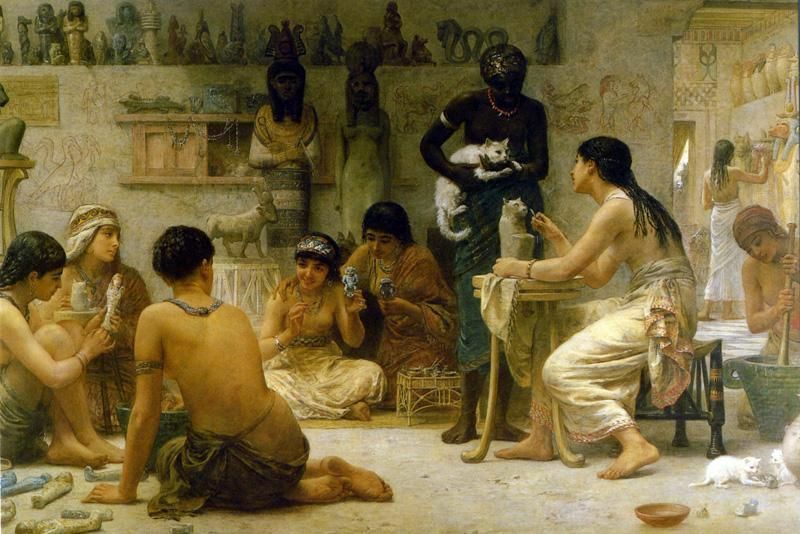 Edwin Long, a British pre-Raphaelite painter’s depiction of a cat model in an Ancient Egyptian atelier. Millennia ago, pilgrims in the Middle East traveled in camel caravans to sacred temples. In those days, they worshipped Ra, the sun god aka “Supreme Tomcat”. 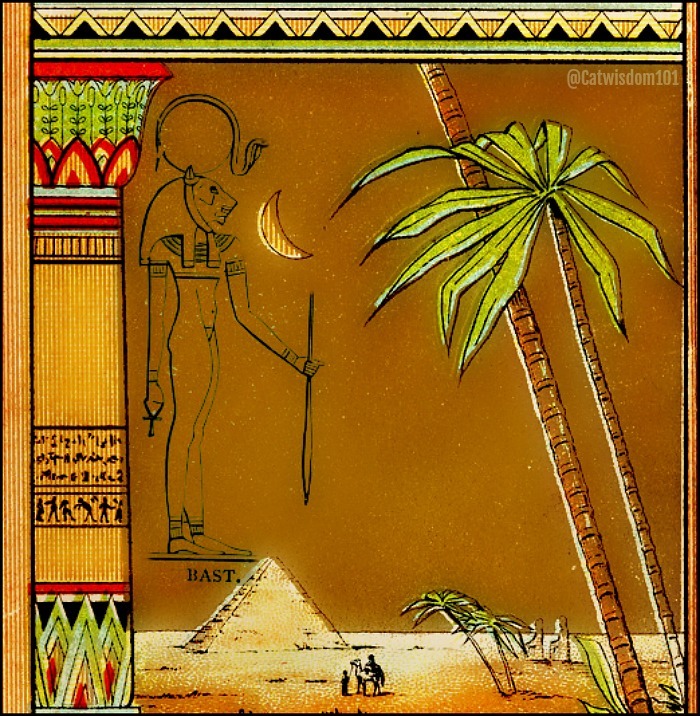 His daughter Bast or Bastet, the cat goddess reigned supreme as did the lion-headed Sekhmet. The pilgrims brought mummified cats as offerings to the cat-headed goddess Bastet along with their written prayers. To clear more space, the kitty mummies were collected and buried in a special necropolis. 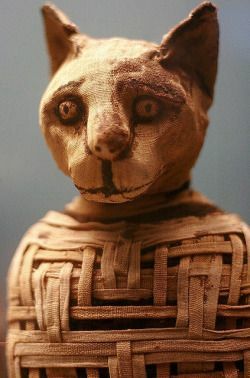 Mummified cat with linen strips from ancient Egypt. I’m an avid fan of Egyptomania or formally known as Egyptian Revival since my art history days in University. Since then, I’ve kept this print above my bed. 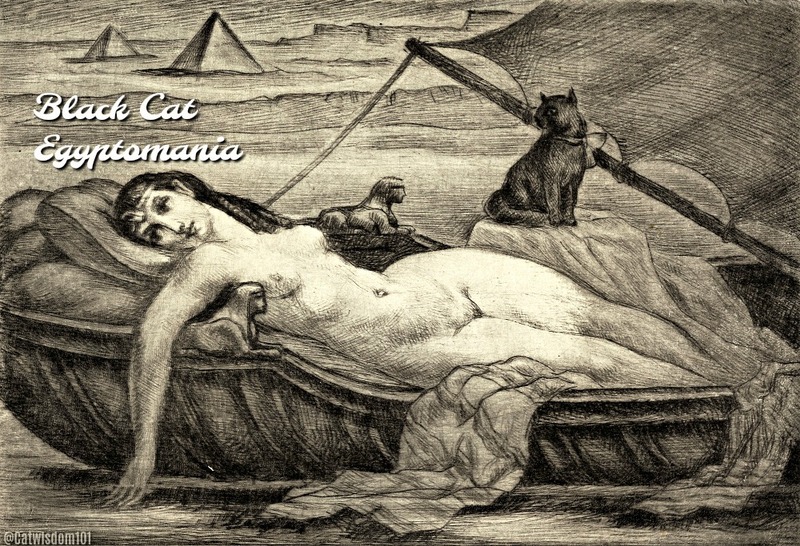 Cleopatra and her pet cat. 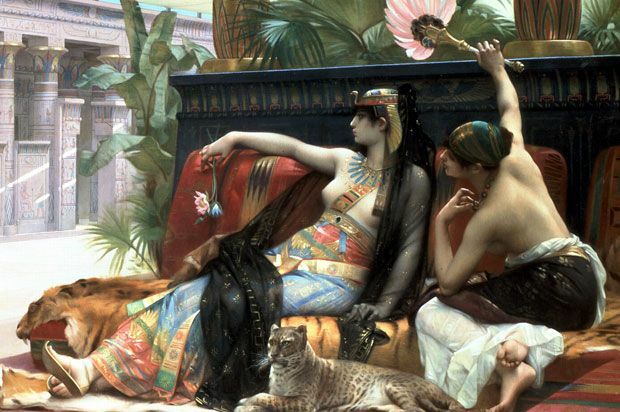 A detail from the 1887 painting by Alexandre Chabanel titled Cleopatra testing poison on death row prisoners. What’s out of frame are are two men carrying a dead body. How many cats can you spot in this illustration? The artist, Wilhelm Gentz, a popular 19th c. Orientalist artist from Germany ventured to Egypt six times. Allegedly these were pilgrims traveling to temples but I suspect it’s more of a flight of fancy. Most people have enough trouble taking one cat in a carrier to the vet. 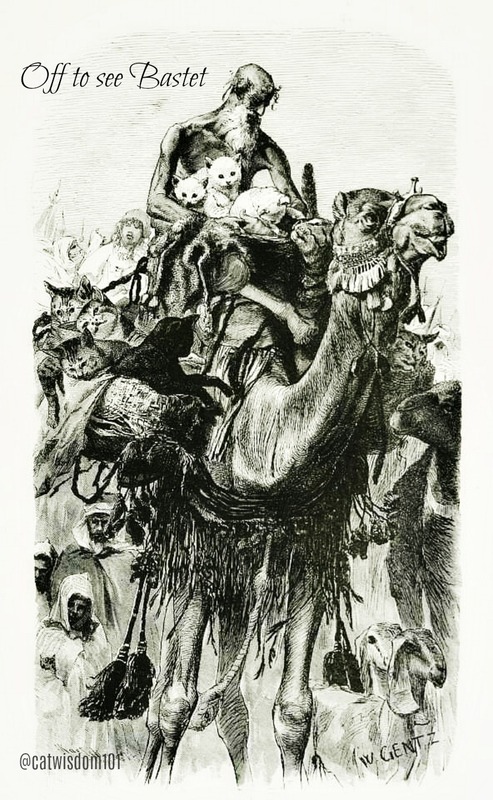 Can you imagine nine cats on camel on trek through the desert? I do know the nomadic Bedouins had no need of rat catchers and did not like or keep cats. Gentz had a steady market for his mystical paintings and a studio in Cairo where he painted exotic Nile and desert landscapes with snake charmers, Bedouins and animals only seen in zoos in Europe and abroad. During his time in 1800s Cairo, it teemed with cats and at least some of them treated royally. A law created by a 13th century sultan insisted a daily feast for cats in a special garden of the High Court. The cat-loving ruler al-Zahir Baybars was the Middle Eastern Napoleon of his time. For at least 700 years his law favored cats but he’d be disappointed to see his beloved felines in Egypt today. Cats became the lucky charms for those living in cities and relied on cats to keep granaries pest-free. Those who could afford cats, fed them well, groomed and anointed them with essential oils. The wore fancy cat collars and even had their ears pierced. When they died they held a funeral and buried the cat in linen soaked in cedar oil. Cedar repels insects and why wooden sarcophagi still exist thousands of years later. 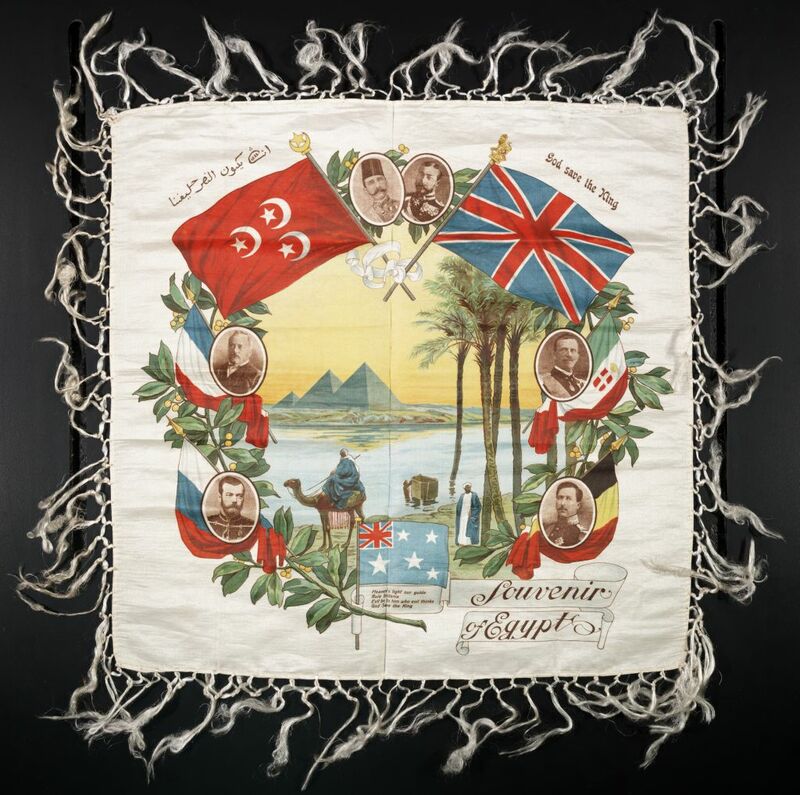 The second wave of Egyptomania stretched from Victorian to the Edwardian era and beyond when King Tut’s tomb was unearthed in 1922. The mania for all things ancient Egypt fueled every aspect of design from fashion, jewelry, furniture and architecture. Those lucky enough to sail down the Nile and picnic on top the pyramids naturally would bring back souvenirs. Tourists today are no longer allowed to climb the pyramids or Sphinx. The opening of the Suez canal drastically cut down travel time. The British in particular relished the warm, dry air for health reasons. If you’re a fan of Agatha Christie, a remake of Death On The Nile in production. The period film is slated for release in December 2019 and guaranteed to capture the romantic heyday of exotic travel. It might spark more interest in travel to Egypt and in turn, more opportunity to visit (and help) our cats’ ancestors. 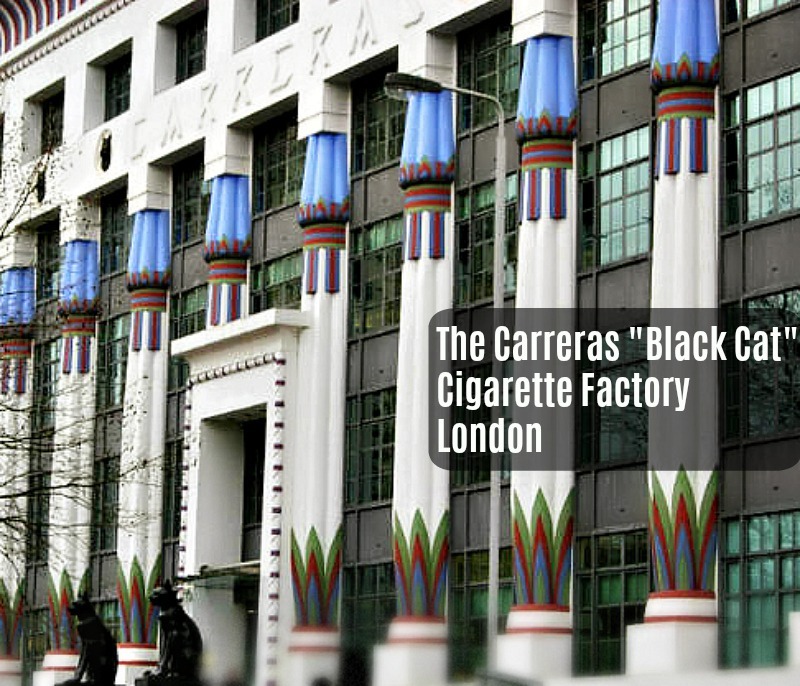 Smoking was not considered a health hazard when the very successful cigarette manufacturer Carreras built an Egyptian Revival factory in London in 1928. Their popular “Black Cat” brand of cigarettes created in 1904 was inspired a shopkeeper’s cat. 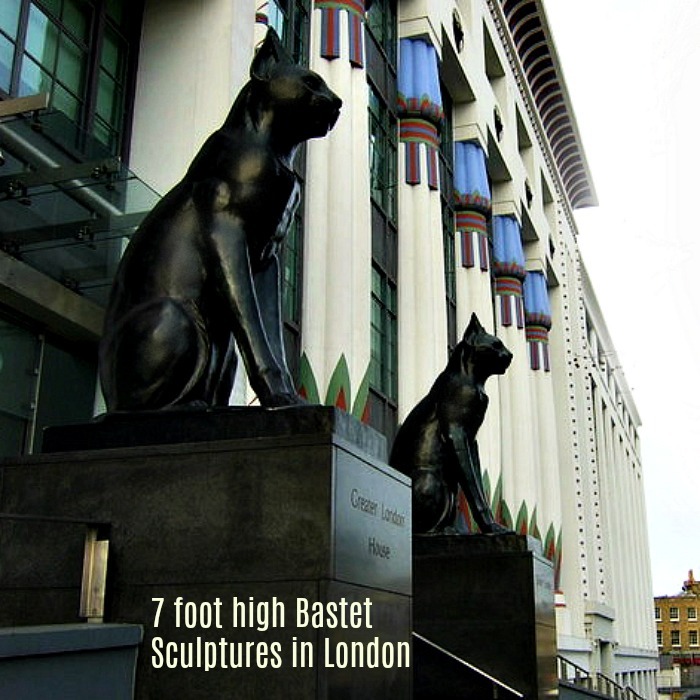 Two 7-foot tall sculptures of Bast still guard the entrance of the former factory today. 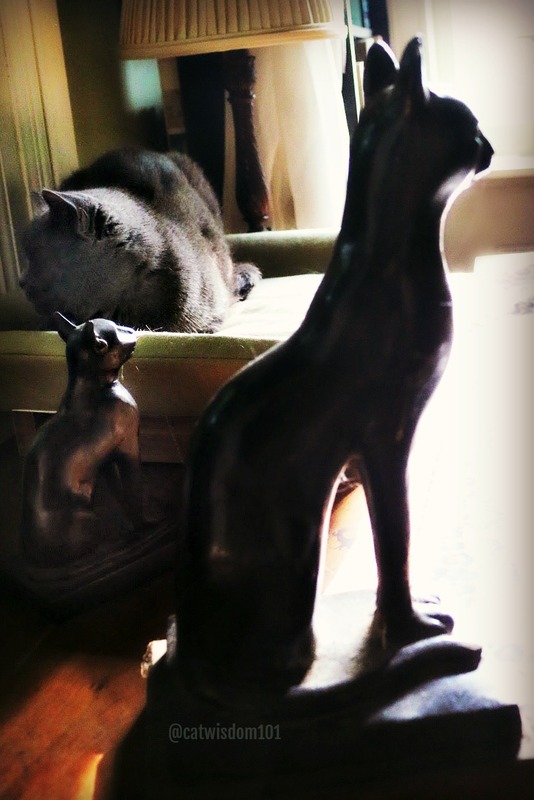 One of my treasured possessions are a pair of antique bronze Bast sculptures I picked up in Paris over twenty years ago. I have a few other Bast figurines and Nou Nou likes napping near them. It reminds me of how sacred cats once were and deserve to be again. Thank you for the interesting article. Just a small correction – the painting of the woman playing with the peacock feather and the cat is not made by Alma-Tadema, but by his protegee, John William Godwin. It’s called “Idleness” and was made in 1900. It’s a very similar style (and subject matter) to work by Alma-Tadema. Thank you, Mary. After a quick search I discovered it’s Godward not Godwin and edited. Yes, you’re right! Thank you for fixing that. If only we could open the hearts, eyes and minds of the world! The people in many countries live a poorer life than many of our worst case animals do. It all needs to stop! We need to end the greed, anger, hatred and apathy in this world!!!! Layla, this post is full of fascinating images and information. As you well know, when it comes to supporting cats, you can’t do better than stopping by your local shelter and checking out their wish list. They are in constant need of everything from paper towels, cleaning supplies, litter, not to mention volunteers! Maggie, thank you and for the wishlist suggestion. I’m all for going local first. We need more volunteers like you. When it comes to cats, Egypt and many of the nearby areas are sadly third world countries. It’s a sad situation. I doubt I will get to Egypt, but a can or two or a bag of cat food to those trying to help is a kind idea. Thanks so much Ellen and it’s true despite everything we are not a third world country. Sigh. OMC! Too bad the cats in Egypt are no longer the revered creatures they once were. Those peeps are missing much this way. I hope and pawray that things may improve. Whoa! Thank you for all the research that went into this great article. It’s a shame cats aren’t still worshipped. TW has some little Bastet figurines in the curio. Thank you for a gorgeous and thought-provoking article. I’m looking at my cat in a new way.